How to get there: From Salt Lake City, go west on Interstate I-80 (about 20 miles), locate exit 99 and exit here onto Hwy. UT-36 going south. Continue south until Hwy. UT-73 forks left (approximately 25 miles). Go 4.6 miles on Hwy. 73, then make a left towards the small village of Ophir (sign). 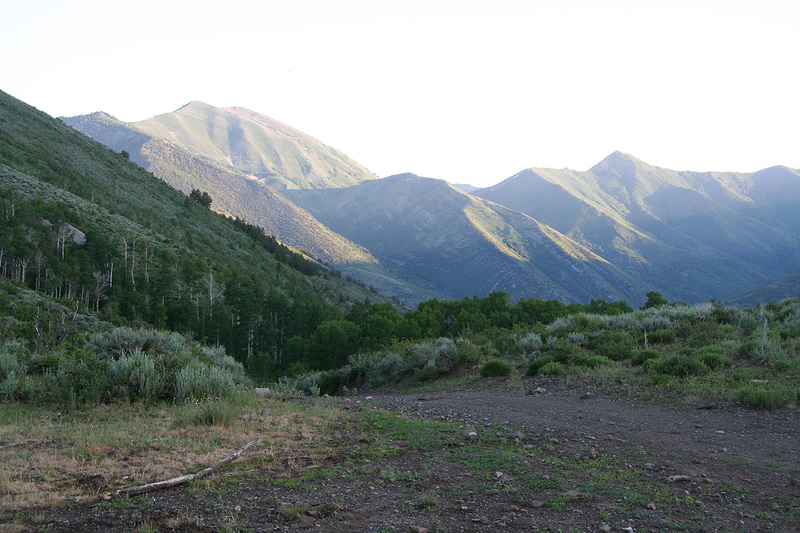 Another 3.4 miles and you are in Ophir, at 4.4 miles you cross a creek (4WD or high clearance recommended.) Drive along a wooden fence on your right hand side and locate a 4WD road that goes right. If you come to a new creek crossing, you have gone too far. Park here, location N40:22.898, W112:14.279, elevation 2035 meter. This (side) road was difficult to spot after dark, but the above GPS coordinates should help. 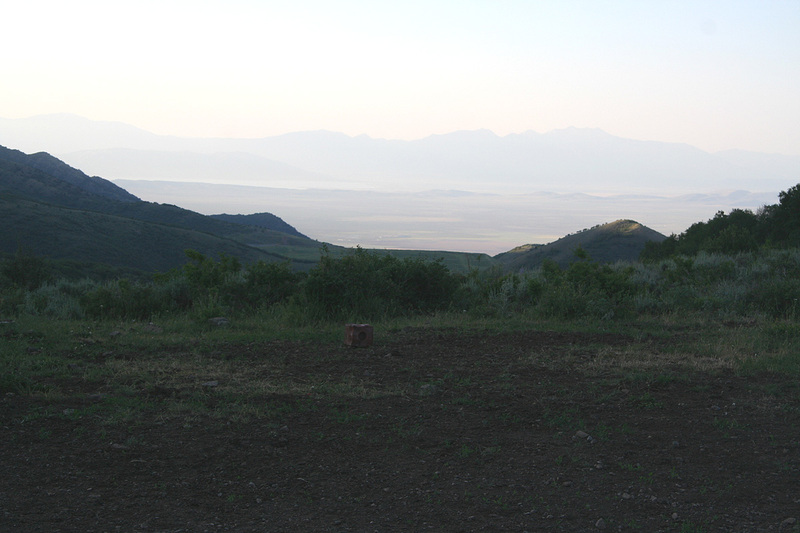 From the Deseret Peak trailhead, one would go back down to the turn-off (approx. 7 miles), then turn right and go 11.4 miles where you turn left. Travel 2.5 miles and hit a railroad crossing as well as Hwy. 36. Go north 1.6 miles to Hwy. 73, then follow the description above. A sturdy 4WD may consider going up this side road to the main saddle, this would cut the hike by 2 hours. The road starts going fairly steeply down to the creek, then across. If your vehicle is ok with this beginning, the rest should go as well. The road is fairly nice most of the way. Route description: First, immediately cross the creek and hike along the side road that forked off at the trailhead. Higher up at a clearing, this road forks, follow the right fork as the route will take us to the main saddle where one gets a view to the other side. 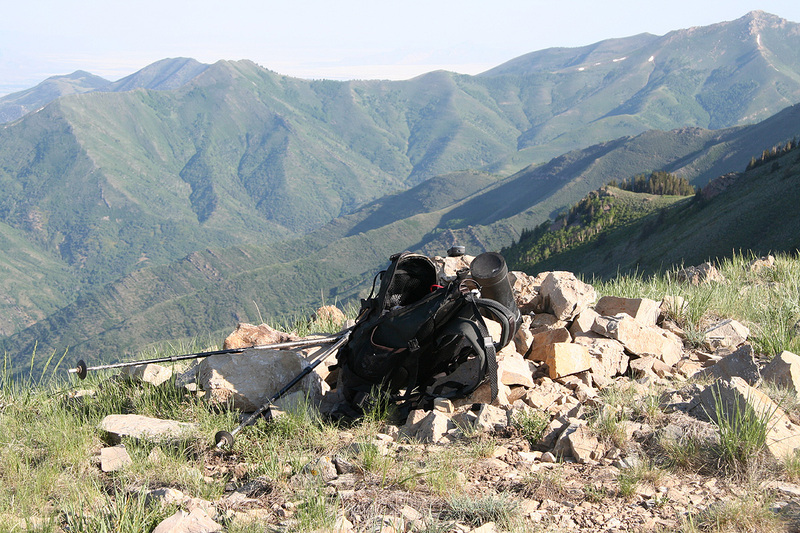 This saddle is located at N40:21.094, W112:13.173,elevation 2458 meter. Head left, following a small road that only runs up the first hill. A trail starts here, but it is impossible to find if you do not know where to look. Go left, and look for a very small cairn (that I left behind). The precise location should be N40:21.151, W112:13.013, elevation 2500 meter. A very faint trail can be identified, mostly covered by vegetation. Follow this trail, it will get much better for most of the way. The trail zig-zags up the first broad slope, sometimes a bit hard to see. Higher uo it contours left and gains a pretty level area before the ridge again climbs higher. The trail stays level and traverses to the right side. Further on, the trail descends a little and crosses a dense section of trees. You should note the trail climbing on the slope on the other side of the trees if you loose it among the dense vegetation. Continue up on the other side and gain a broad ridge like feature. Go a bit up this ridge (that is left) and locate the trail that now traverses left in order to gain the main ridge above. (The trail is a bit ill-defined just here). From this broad col on the main ridge continue uphill along the ridge, staying left when convenient. 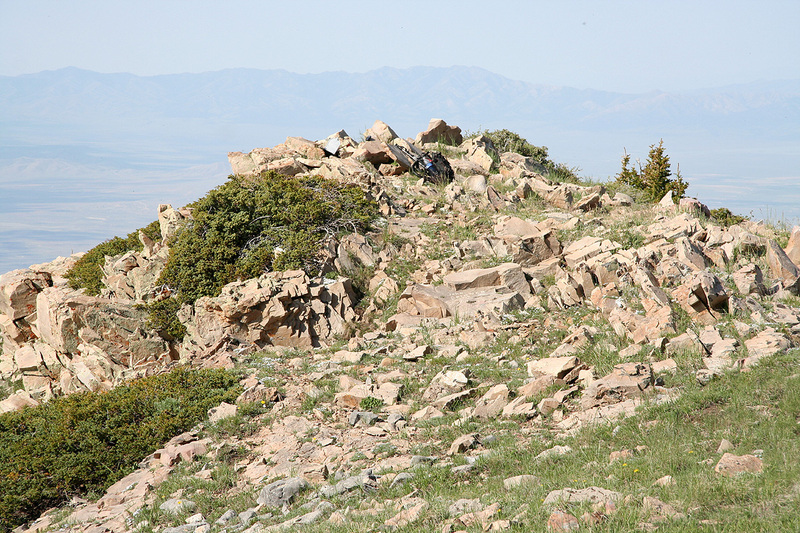 This route takes you directly to the summit of Lewiston Peak, location N40:21.606, W112:11.646, elevation 3173 meter. 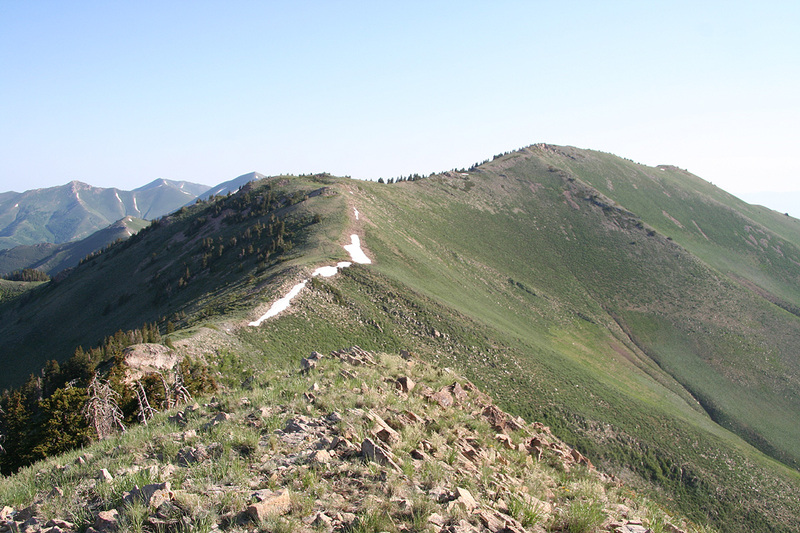 You may bypass this peak by following a trail that descends slightly off the ridge and to the saddle that separates Lewiston Peak from Flat Top Mountain. 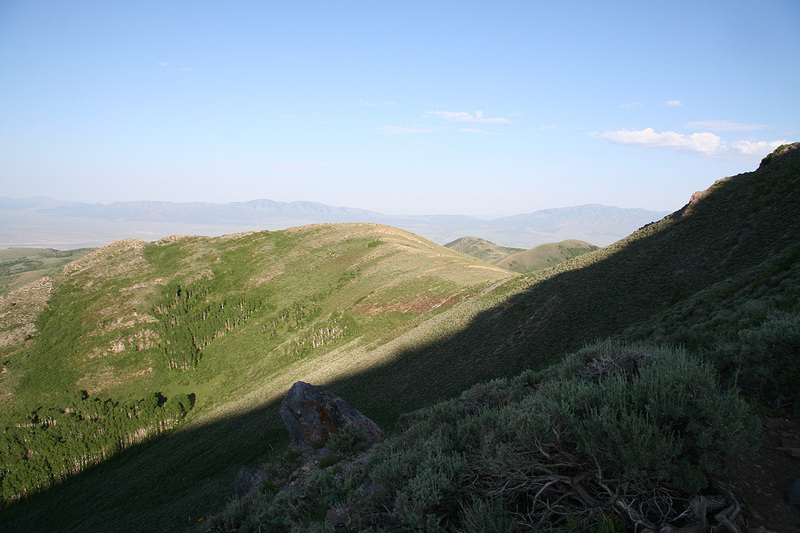 Descend to the saddle and follow the gentle ridge in order to reach Flat Top Mountain. 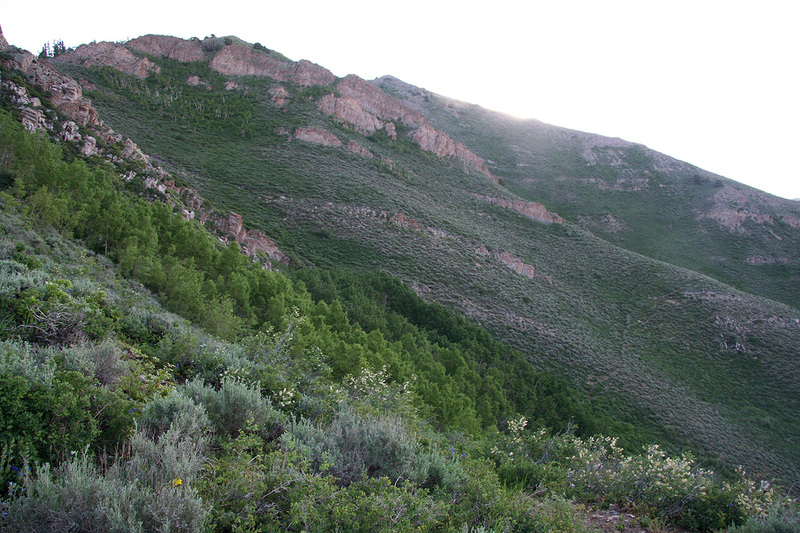 Comments: After my evening hike on Deseret Peak, I decided to drive across to the trailhead for Flat Top Mountain in order to get changed into early morning starts. My two climbs so far had been rather late starts. I drove to the small village of Ophir without problems. My description called for locating a side road 1.2 miles after Ophir. Easier said than done, by now it was dark and I drove at least 2 miles without seeing any road going right. Somewhat worried that my description for this climb was rather brief, I returned to Ophir and asked two different places. 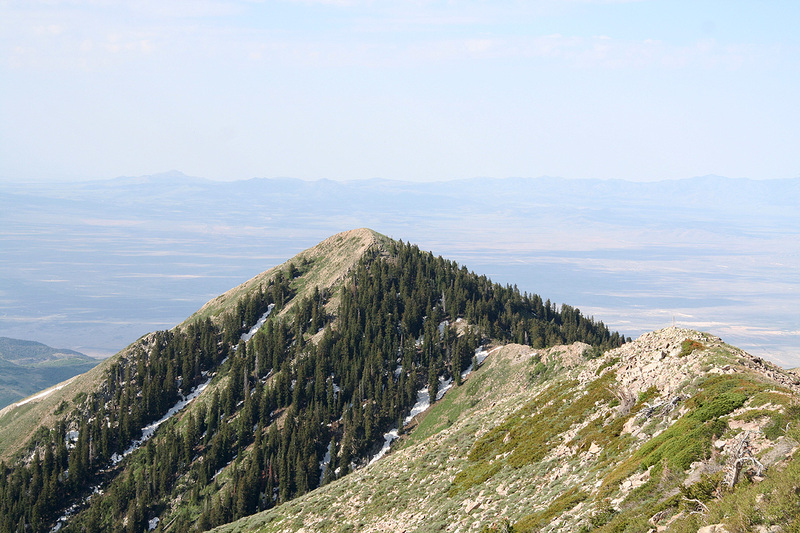 Neither man had ever heard about Flat Top Mountain or Lewiston peak for that matter. Well, I drove back up the valley, located what looked like a nice place to camp, parked and went to bed in the rear part of my truck. I assumed that daylight might help solve my navigational problems. I woke up by 0500, it was still semi-dark. Breakfast, then a slow drive down the road with many stops to explore possible candidate side roads. Finally, I got to the trailhead. There was little doubt, a clear dirt road headed up the valley to a col, this all matched my idea of the climb pretty well. I was on my way at 0605, met a few cows along the road and arrived at the col at 0700. A small road headed uphill my way, however, it soon ended. There were no trails to be seen and I started more or less straight uphill. The vegetation was not too bad. I had just come to terms with the fact that this climb would be off-trail, when I came across a very clear trail climbing from my left towards the right. What luck, I should definitely find out where this trail starts upon my return. The trail was obviously climbing this slope, however, it would benefit from some more use. A few places pretty hard to follow as nature is doing its best trying to reclaim it. Soon, I arrived at a flat section with the main ridge going higher a bit further ahead. The trail traversed out right and eventually climbed a small saddle higher up. The going was easy and by 0835 I arrived on Lewiston Peak. 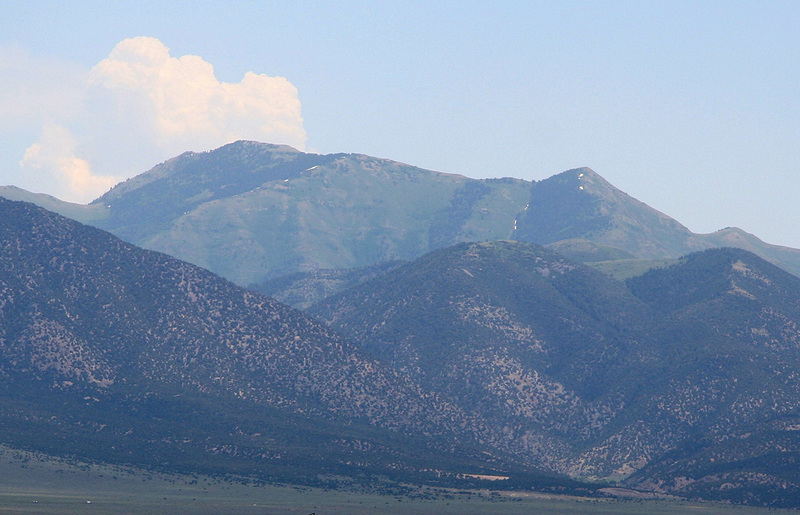 I rested 10 minutes, signed the summit register and looked ahead to Flat Top Mountain. The remaining hike looked quite easy. Lewiston Peak has a prominence of 73 meter (I measured the two possible saddles), thus qualifies as a sub-peak of Flat Top. 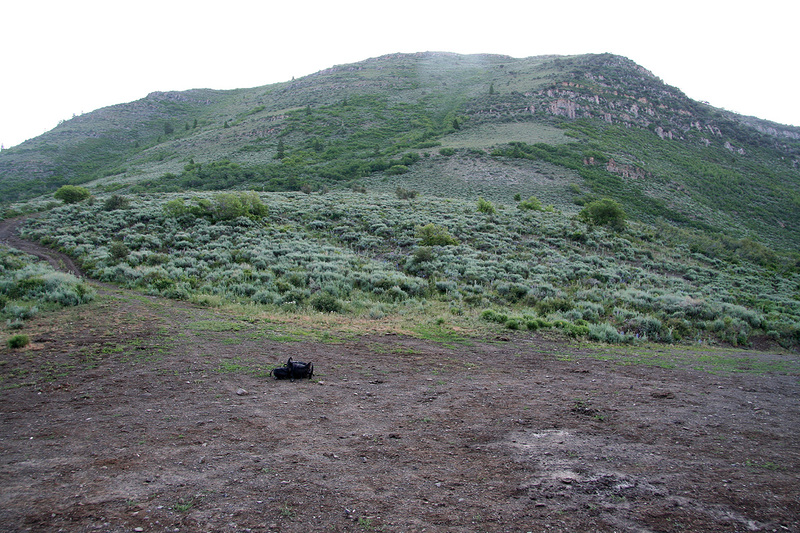 I arrived on Flat Top at 0920 and decided to have a good rest on this very nice viewpoint. 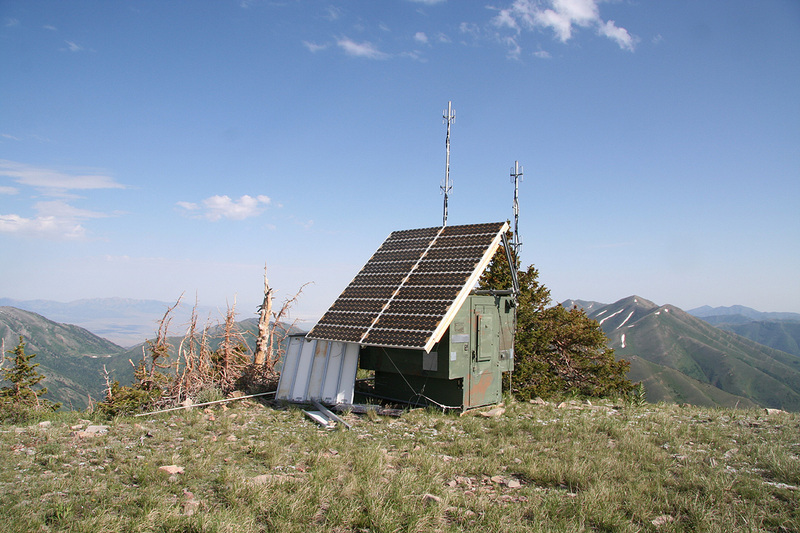 A solar powered antenna was located nearby. I signed the register and noted that few people climb this peak. There had been a single climber (on both summits) only 3 days ago, otherwise not many visitors this year. A group had skied up here back in March, reporting good conditions. I left at 0950 and bypassed Lewiston on the right side. It was getting hot and I was happy about my early start. I was back down at the car at 1205, thus making this a six hour trip altogether. Flat Top Mountain. 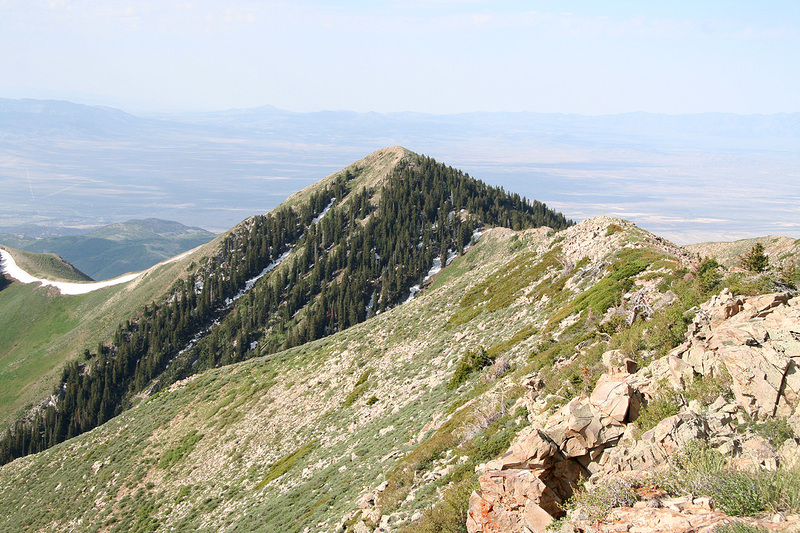 Lewingston Peak is the subsidiary peak on the right side. The summit of Flat Top Mountain. 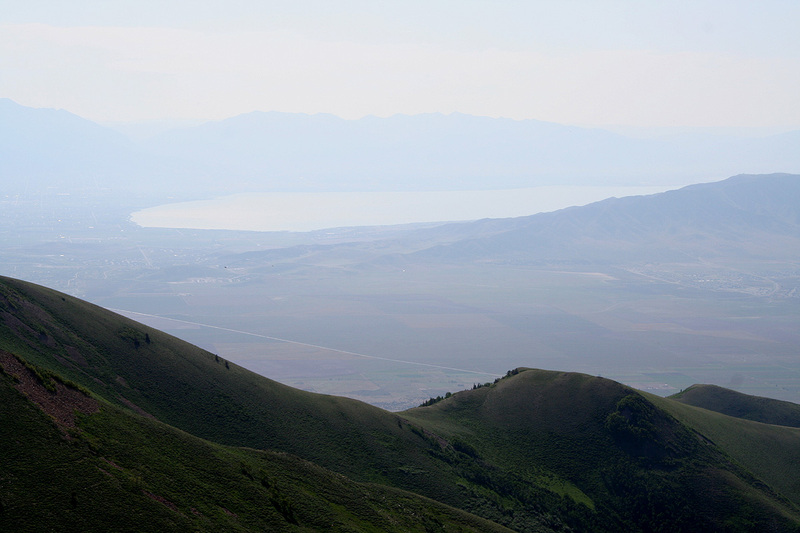 Lewingston Peak, as seen from Flat Top Mountain.